What better way to celebrate Valentine’s Day than by enjoying delicious food on the cheap? Tons of restaurants across San Antonio will be offering Valentine’s Day freebies and discounts, from heart-shaped bites to dinner specials for two. Auntie Anne’s — Buy one, get one heart-shaped pretzel free this Valentine’s Day. Make sure you bring this coupon. Boston Market — Enjoy two individual Rotisserie Prime Rib meals for $29.99 or take $5 off a family meal with this coupon. California Pizza Kitchen — This dinner for two deal gives you an appetizer, two entrees, and one dessert for $35. Available February 13-17. 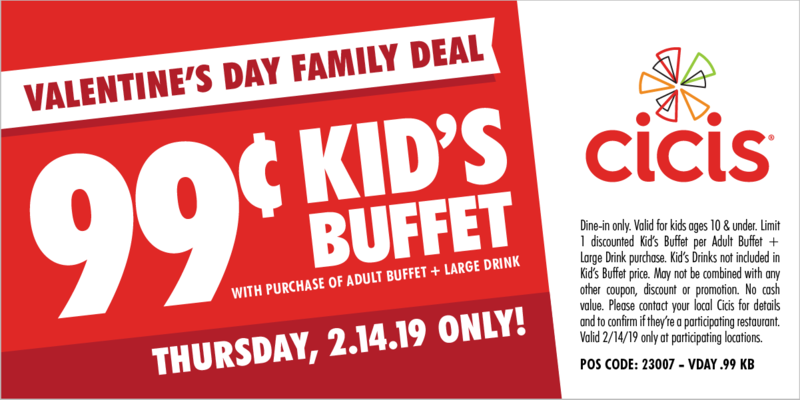 Cicis — When you purchase an adult buffet meal and a large drink, you can get a Kids Buffet for just 99 cents using this coupon. Dunkin’ Donuts — Heart-shaped donuts make their return this Valentine’s Day at the popular donut shop. Firehouse Subs — Get a free dessert with any purchase this Valentine’s. Fogo de Chao — Purchase a churrasco lunch, dinner, or Sunday brunch at Fogo de Chão between February 14-17 and earn a complimentary dining card for another churrasco lunch, dinner, or Sunday brunch that you can enjoy February 18 – May 2. Hooters — Not in the Valentine’s spirit? Shred a photo of your ex, and receive 10 free boneless wings with the purchase of 10 wings. Hungry Howie’s — Get a heart-shaped pizza with a single topping for just $6.99. You can add on a heart-shaped cheesy bread as well. Jack in the Box — Order food on the Jack in the Box app this Valentine’s Day and score a free dessert. McAlister’s Deli — Valentine’s Day is Family Date Night at McAlister’s where kids eat free with the purchase of an adult entree. For kids 12 and under; dine-in only. Valid for up to two kids’ meals. Olive Garden — This dinner deal for two includes breadsticks, dipping sauce, soup or salad, one shareable entree for two, and a shareable dessert. Prices start at $35.99. Papa John’s — Score a medium heart-shaped pizza for $11 this Thursday. Potbelly Sandwich Shop — Celebrating solo this year? Singles can get a free cookie this Valentine’s Day. Schlotzsky’s — Get a free 3 oz. bottle of Schlotzsky’s Hot Sauce February 14 with any purchase. Are there any other Valentine’s Day deals in San Antonio we left out? Let us know by leaving a comment.